An Issi in GTA V.. 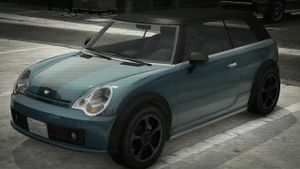 The Weeny Issi is a three-door convertible in Grand Theft Auto V.
The Issi is based on the convertible Mini Cooper, with headlights from a Porsche 911 (Type 996). The name 'Issi' likely refers to the designer of the original Mini, Sir Alec Issigonis. Can be purchased from southernsanandreassuperautos.com for $18,000. If Trevor Philips drives near the De Santa house in an Issi, Michael will text him saying that he is driving Tracey De Santa's car, even if the player did not steal Tracey's car. This page was last modified on 15 April 2015, at 02:26.